The article was originally published on the website of the Louis Dreyfus Fondation d’entreprise, one of the Scholarship Programme’s generous donors. The Foundation’s work includes promoting sustainable agriculture and improving food security throughout the developing world. The behaviour of small-scale farmers has changed in many areas of rural South Africa. This is a result of a complex mix of factors that impact on one another in various ways undermining the ability and the desire to cultivate. My research was conducted in Mbotyi, a small coastal village in the ex-Transkei region of South Africa, previously a semi-independent ‘homeland’ during Apartheid. It is in regions like this that the bulk of South Africa’s rural poverty is concentrated and that the greatest challenges for rural development exist (See below, notes 2 & 5). The problem I address is one noted by a handful of authors (notes 1,4 & 7): There has been a marked movement away from the cultivation of arable fields in the former homeland areas of South Africa, leaving available land underutilised. I set out to gain a better understanding of why rural South Africans, in a context of relatively high levels of unemployment and poverty, are leaving fertile fields fallow in regions where agriculture has historically been a cornerstone of livelihoods. The literature on ex-homeland agriculture and livelihoods has focused on larger structural concerns, seldom considering the perceptions and opinions of their inhabitants. The orientation towards structural underdevelopment has helped to provide context but does little to shed light on what people actually do. In researching topics like this I believe it is important to engage with those whose behaviour is changing, obtaining their perspectives and understandings of the day to day realities of life in rural South African agricultural communities. I thus stayed in Mbotyi for a couple of weeks during March and April of this year travelling around the village, observing its goings on and getting to know its personalities. I was able to conduct 34 interviews with 23 male and 11 female villagers ranging in age from twenty to ninety-four, and to map cultivated areas. An investigation on this scale allowed for a multi-facetted investigation of the issues that confront cultivation in Mbotyi. I found that a range of interlinked and inter-reliant factors- a complex mix of incentives, changing attitudes and a shifting social landscape- are driving changing behaviour. People have integrated themselves into the economy in ways that minimise household risk and maximise return for labour expended. Nevertheless, I found that people in Mbotyi have not abandoned agriculture wholesale, rather they have responded to these incentives and pressures by adjusting their livelihood activities and changing their behaviour, altering the nature and extent of their agricultural activity. 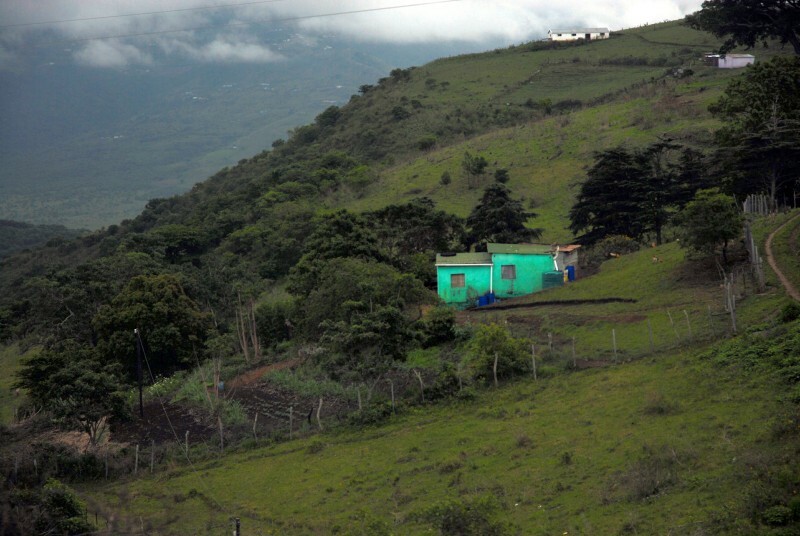 The evidence was that the area of land cultivated has declined in a context of intensifying environmental pressures (trouble with wildlife and cattle- an integral part of Xhosa society, fulfilling the role of a savings vehicle and a mark of status, taking primacy over crops, changing weather, and access to water), decreased access to household labour (the result of an erosion of patriarchy which has afforded women and children greater freedom, urban migration, and evolving youth aspirations partly due to wider school attendance) and alternative income sources. The availability of cash, largely a result of welfare payments (the state post-1994 has rolled out an extensive social welfare programme providing widely drawn on grants to pensioners and single parents whose incomes do not exceed a stated level), in addition to the youth’s ideas about what a good life entails have served to undermine the necessity and the desire to cultivate, for personal consumption and for sale. One interviewee expressed her opinion on the issue instructively: “Yes, they decided to stop farming. Since Mandela started to give them money for the pensions and the grants and all of those things, those people that were farming before, they stopped. And I saw them, after they got money; they’re always going to Lusikisiki to buy food instead of farming. I believe that is because of the money. If they don’t get money, I’m sure that they won’t stop farming; they will carry on because they know [how to], and they have got experience for farming. Only those that don’t get money from the government, they are still farming.” An erosion of traditional patriarchy and control of the youth has met with (and to an extent is a result of) altered youth aspirations that preclude a completely agricultural livelihood. People are becoming better educated and increasingly proletarianised, preferring wage-paying work and the purchase of food. This is happening at a time when access to cash from welfare payments and other activities enables less reliance upon the land. A dynamic, generational shift is underway as increased disincentives to cultivate encounter a decreased need to do so. Nevertheless, cultivation is still a vital part of village life. The majority of households are engaged in some agricultural activity (a handful as their primary occupation) and certain sections of society still profess to being extremely interested in it. Many said that they were eager to cultivate when/if they were in a position to do so. Others are already in the process of establishing new gardens. There was also a strong interest in agriculture amongst those youths who have returned from the cities having failed to find employment, indicating that cultivation is serving as a ‘fall-back’ occupation – a safety net for the unemployed. If the people of Mbotyi (and the multitude of areas like it) had access to expert advice, to piped water (easily achievable with a gravity fed system), fencing to protect crops from cattle and wildlife, and a tractor (which could plough all village land in a week or two greatly reducing labour requirements and overcoming issues of access to draught) it is my opinion that cultivation in the village would flourish, improving rural livelihoods, enhancing food security and promoting developmental objectives. Directed interventions of this sort stand the greatest chance of success. Louis Dreyfus-Weidenfeld Scholar at Oxford University (2013-2015). Bank, L. & Minkley, G., 2005. Going Nowhere Slowly? Land, Livelihoods and Rural Develocinpment in the Eastern Cape. Social Dynamics, 31(1), pp.1–38. Beinart, W., 1992. Transkeian smallholders and agrarian reform. Journal of Contemporary African Studies, 11(2), pp.178–199. Fenwick, L. & Lyne, M., 1999. The relative importance of liquidity and other constraints inhibiting the growth of small-scale farming in KwaZulu-Natal. Development Southern Africa, 16(1). Kepe, T., 2005. Magwa Tea Venture in South Africa: Politics, Land and Economics. Social Dynamics, 31(1), pp.261–279. Kleinbooi, K.. 2013. Land reform, tradition and securing land for women in Namaqualand. In Hebinck, P. & Cousins, B. eds., 2013. In the Shadow of Policy, Johannesburg: Wits University Press. Mfono, Z. et al., 2008. Directional trends in selected aspects of rural poverty in the Eastern Cape Province: changes during the first ten years of South African democracy. Development Southern Africa, 25(1), pp.37–60.